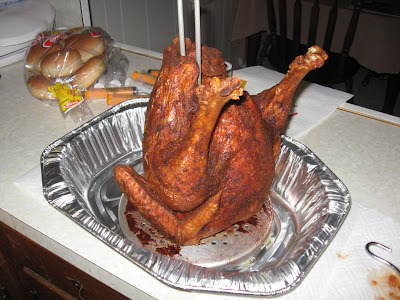 Home » blogging , The Knight Shift , turkey frying » "No matter where you go, there you are." Awright, first person who can tell me what obscure mondo-bizarro film that is from, can buy themselves a candy bar and pretend I got it for them. I'm... not quite ready to return to this blog at the usual frenetic frequency that all two of my loyal readers have come to appreciate. According to my figures there had been an average of five new posts a day for quite some time now. But if you look at the front page that I'm seeing right now, there've only been twenty-five posts since mid-August! Clearly, something has been amiss with Your Friend and Humble Narrator. I'm not retiring The Knight Shift (well, not planning to anyway: some claim that this blog has caused more mischief than WikiLeaks... and look at where that site has gone lately!). But there is certainly - and there has already been - some significant "shifting around" of sorts behind the scenes as I have had to wrestle with quite a bit in my personal life. And I may or may not have divulged more than enough of that already. What can I say? I believe in being honest and sincere. And most especially to and about myself. As the Bard wrote in Hamlet, "To thine own self be true". I believe that. Even when my own self is wracked with common human foibles and frailties and a few more common than we often care to admit. This blog has always been about things that interest me, that I believe others might find interesting as well, and as a place where I can share my thoughts and reflections on various matters. This site in its seven years of operation has done quite a lot: from movie reviews, to chronicling my running for public office, to premiering movies that I have made with friends, to documenting the exploits of the last great American moonshiner, to taking on a multimedia giant in a copyright dispute (and prevailing in the end), to recipes, and well... just about anything and everything in between. And now, there is something else that I'll be writing about and reflecting upon. Not a new thing, but something that I'm inclined to believe is important enough to share some perspective about. And maybe others will come away from this blog even a bit wiser and more enlightened for the time spend reading from it. In the end, that is all any writer is really hoping to accomplish. So that is what I'll be doing. Along with everything else that readers have come to expect from this blog. And Lord willing, I'll be doing more of that sooner than later. Ahhh c'mon: y'all didn't think that I wouldn't properly document something like that, didja?! I look forward to the Three Musketeers that I buy myself. You know, I wondered. About the turkey. If you're interested I'd like to contribute towards your blog Chris if you want to open the 'floor' to contributors? (of course you'd have final say topic, style and edit). I'm sure many of your readers would love to do guest fills for this blog as its become a daily mainstay read for a lot of us. Glad to see another post, Chris! FYI, you can pick up up a copy of the Buckaroo Banzai Enhanced Soundtrack CD at MonstersInMotion.com. Well worth the price. Good choice for soundtracks. I got that on your recommendation, and I must say it does not disappoint. Good to have you back. I always enjoy your posts, and visiting here s a highlight of the day. You never know what you're going to get, but whatever it is is well worth the read.